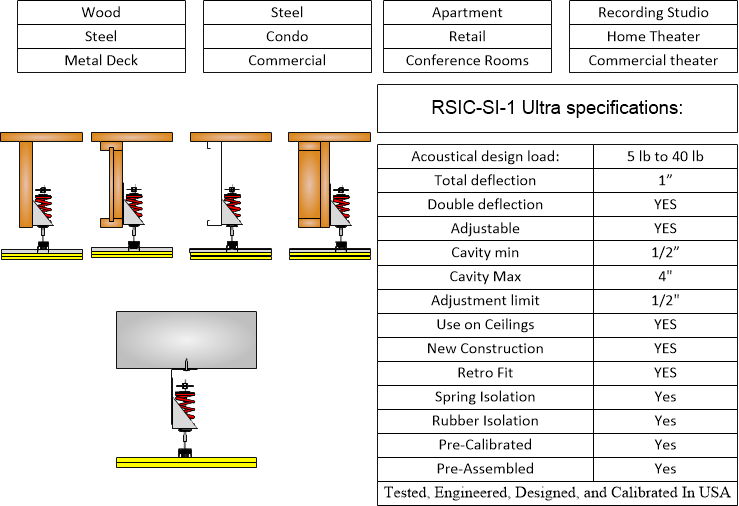 The RSIC SI-1 Ultra is designed for use with any wood framed, steel framed, or concrete (with Over Head Adapter) ceiling system where noise control is needed. The RSIC-1 assembly decouples and isolates the gypsum board or plywood from the structure increasing the acoustical performance of the system. With an Acoustical design load range from 5 lbs to 40 lbs per isolator, the RSIC-SI-1 Ultra clip can support up to two layers of 5/8" gypsum board when spaced at 24" x 48" oc. For heavier systems increase the number of isolators to support the additional weight of the system. The RSIC-SI-1 Ultra clip fastens directly to the framing or structure creating an air cavity between the face of the framing and the back of the gypsum board. The RSIC-SI-1 Ultra stops the noise and vibrations that typically would be allowed to transfer through the structure.